There comes a time in every marketer’s life when you have that “AHA!” moment and realize you actually know what the hell you’re doing. And with that realization comes great responsibility. When you reach this point in your career, it’s time to stop practicing the same old 101 marketing tactics and graduate to the next level. You’ve mastered the basics and it’s time to sit at the big kid’s table now. It’s easier said than done, because implementing the same 101 marketing tactics over and over becomes comfortable, like an old pair of leggings, and everyone is yelling at you that leggings aren’t real pants (YES THEY ARE - #leggingsforlife) and to put some real pants on. 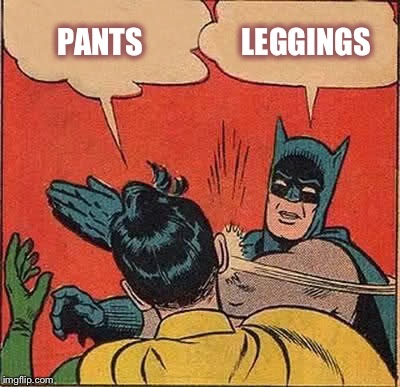 Well, as much as I love leggings, let’s put some real pants on and get serious about our marketing strategies. The thing is, I had this realization recently when I was at HubSpot’s INBOUND16 conference this month and was attending breakout sessions. Some of the sessions were high-level with awesome takeaways and were exactly what I was looking for, and others, well, not so much. I realized that a lot of the topics that seemed like they were going to be high-level and would be helpful for me to put to practice in ongoing client campaigns for our digital marketing agency became super watered down and 101, and were things that I was already doing. So, ta-da! This blog article was born. I’m going to touch on some topics that can become extremely 101 in practice, but can be taken to the 201 level and will really give your campaign the extra boost that it needs to move the needle and drive results when executed properly. Why it’s 101: The idea to create a “seamless” experience for your visitors across channels? Duh, makes sense. But, remember, multi-channel and omni-channel marketing are two different games. Your strategy isn’t actually omni-channel if everything isn’t working together strategically and you’re just saying you’re using omni-channel marketing because you have multiple channels across your social, website, etc. Thus, it becomes 101 the second you mistake multi-channel for omni-channel. How to make it 201: Utilize omni-channel marketing to maintain consistency in user experience (and actually consider user experience – hello, mobile responsiveness?!) but also have a customized strategy for each channel. You still have different audiences depending on the medium, each channel serves a different purpose, and device usage varies. Therefore, you need to customize the strategy for each channel and consider all of the variables, but roll it up into one grand omni-channel strategy so they all work together in harmony to achieve your overarching goals. So What? : To avoid customers, prospects, etc. experiencing a less than seamless experience across channels, consider your overarching brand and messaging. Once you have that established, consider the channels you are leveraging (both internally and externally) and what you can do to keep the user experience consistent and avoid any confusion. The key is to involve key stakeholders, employees, vendors, etc. in this process so everybody is on the same page. The goal? Your brand should seem like a living, breathing person. As a Millennial, (I’m sure Eric Pratt has some witty comment about Millennials he can contribute here), I am a digital native with a Facebook, Twitter, LinkedIn, Instagram, you name it. People know my personality and should expect to get the same “me” on all of these channels as they do when they meet me in person, but I don’t post the same type of content on every channel. Your brand should be the same way. Why it’s 101: If you ask anyone, what came first, “the chicken or the egg?” they can debate with you all they want but can definitely come up with some cookie-cutter answer. Same goes for which comes first, “strategy or execution?” Any marketer knows the “right” answer… strategy, of course, but do they always do this in practice? No. 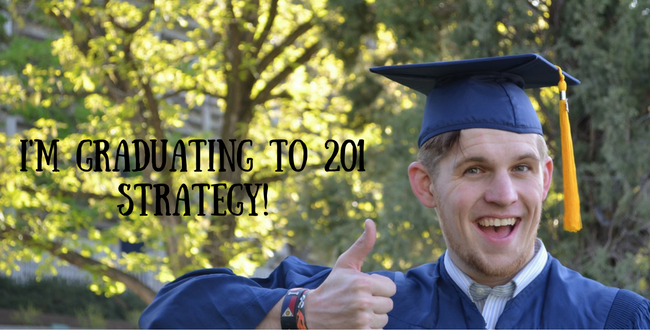 How to make it 201: Actually build the strategy and execute on the strategy. Often times someone can build strategy because they’re “supposed” to, but then totally forgo it in favor of churning out content and getting caught in the whirlwind of day-to-day marketing activities. So how can you actually go about executing the strategy you spent all of that time creating? See below action items. Action Items: Create a cadence of accountability with yourself and your team. Ensure that the execution of a campaign follows what was laid out strategically, for a reason, and is what was agreed upon in order to achieve your established goals (and, step one, make sure you actually have a process in place to create strategy based on goals). Make sure the established strategy is known and is kept in some sort of document to make it easily accessible to everyone who has hands in the campaign to ensure everyone is on the same page and executing accordingly. Follow the roadmap! Why it’s 101: What a buzzword! We’re using smarketing. It’s all about smarketing. Barely anyone is actually achieving smarketing. How to make it 201: To actually achieve alignment between sales and marketing, it has to happen from the very start of a campaign. You need to establish lead parameters and definitions and integrate various tools so they actually make your life easier, not more of a mess. And, you need to put automation in place as much as possible to eliminate unnecessary steps or human error. But, it doesn’t stop there. Constant communication with the sales team is integral to ensure processes are being followed, to get feedback on lead quality, and integrate their day to day sales processes, etc. It’s all about sales enablement, kids. Now What? : Stop fighting the sales team. Sales and marketing are no longer two departments that are competing for attention. Do everything possible in your power to get sales and marketing in harmony. If you don’t? Everything marketing does becomes moot. With the mindset of, “We’ve been generating all of these great leads from our marketing efforts. We’ve done our part! Now there’s nothing more we can do.” You’re going to see how flawed that logic is real fast when you’re the one on the line because of a lack of bottom-line results. So, again, implement and inject sales enablement into all aspects of your campaign, and do it fast. Why it’s 101: By now, everyone gets it. TOFU, MOFU, BOFU. Building content for personas at the right step of the funnel. Now what? How to make it 201: Consider more than just a lead funnel. What about a customer funnel? What about the “OOFU” stage nobody considers? Once you have a funnel in place, then what? Is it working or not? What else can you do to be different or take it to the next level? So many questions to be asking yourself. Right now. What Now? : Step away from the cookie-cutter, 101 marketing funnel concept for a moment. Yes, it is perfect for when you’re just getting started establishing your marketing strategy and developing your content. But, after a point, you just need more. You need to get more sophisticated and evolve as your campaign evolves. After all, there’s only so many TOFU eBooks you can create for Martha the Marketer before it becomes excessive, right? And, by now, your competition knows this concept, too. Think outside the box and see how you can leverage existing content in new, exciting ways. And, don’t get complacent. Give your funnel and content library a hard audit at least once a year, if not quarterly, to see what you need to change up and how you can update it effectively. Why it’s 101: Yeah, we use Google Analytics. Yeah, we use HubSpot reports. We’re collecting data and stuff. Okay, so what? How to make it 201: Actually use the data? Bounce rate too high on a blog? Add recommended content or CTAs at the bottom. See what the data is actually telling you so you can make informed decisions. And, don't just use web data. Use marketing data, too. What You Can Do: Take a deep breath. Meditate. Do some yoga. Whatever it takes to prepare yourself for a long, grueling date with data. Commit to sitting down and really sifting through the data. Take a big picture look first and see if you can notice any overarching trends or areas of concern that stick out. Then, dive in to specific areas of the campaign to see where performance may be subpar. The data will tell you a lot. And it’s a damn sin to have all of these awesome tools at your disposal and not take advantage of them to actually help you in your marketing efforts. Don’t be ashamed if you’ve been fooling yourself by thinking you were executing really strategic, high-level marketing campaigns when you actually fell into the 101 buzz-marketing trap. There is always a time and place for 101 marketing; these concepts exist for a reason (because they work!) just as there will always be a time and place for leggings (especially around Thanksgiving dinner #amiright?) But why settle for the tried-and-true 101 marketing tactics that everyone else is using when you can take them to the next level? Everybody’s got to start somewhere, but the question is, where do you want to go? It’s time to get there. 101 marketing is SO 2016. Start 2017 off right with 201 strategies and put on some real pants. If Kelley isn’t hard at work for her clients she is hard at work at the dance studio. Kelley spends her spare time coaching a high school dance team. She was a dancer at the University of Colorado – Boulder, where she also graduated with a degree in business administration which helped prepare her for a career in marketing. She’s now an industry veteran with six years in various roles under her belt.